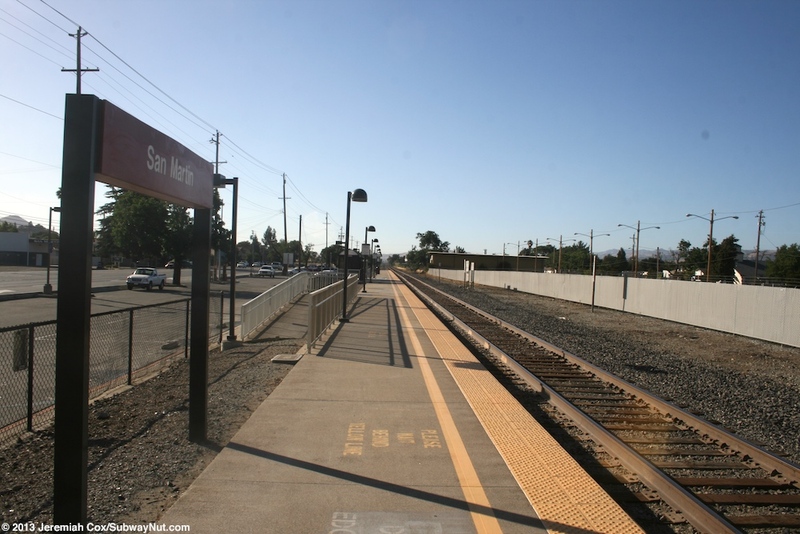 San Martin is an intermediate stop on the peak-hours peak direction Caltrian extension to Gilroy. 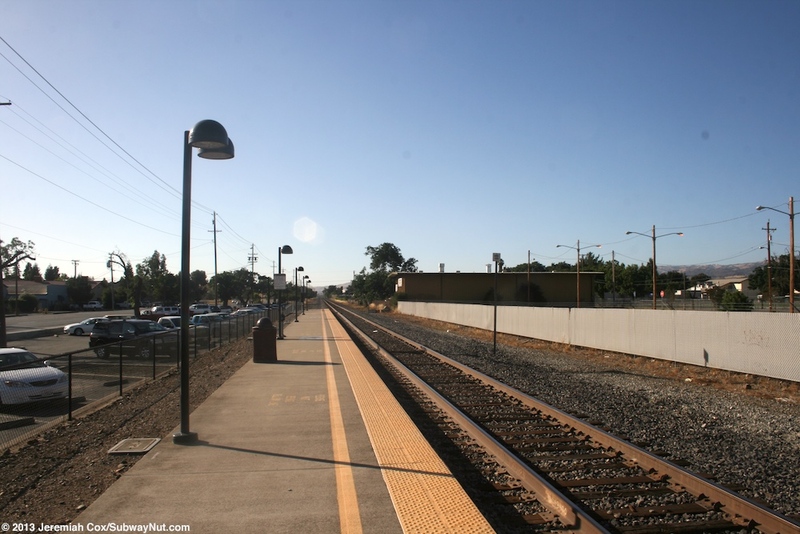 The station opened as an infill station a year after Caltrain was extended to Gilroy on April 19, 1993. The stop is extremely simple. 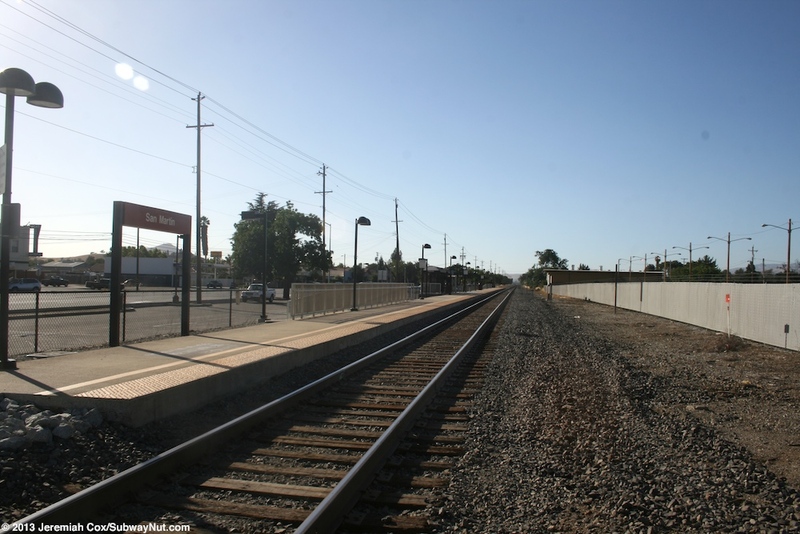 It consists of a single side platform on the west side of the single track that is also used by the Coast Starlight and passes the station platform. 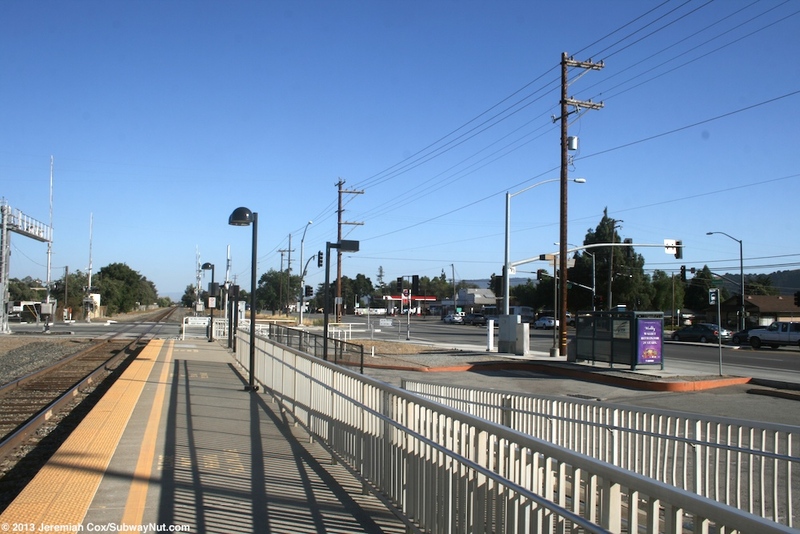 This platform begins at the grade crossing of San Martin Avenue and runs north. 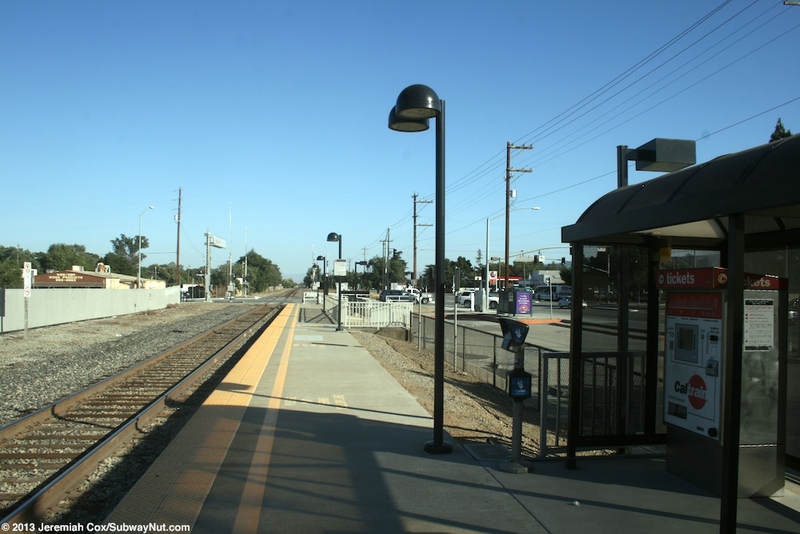 A narrow parking lot runs between the platform and parallel Monterrey Avenue. 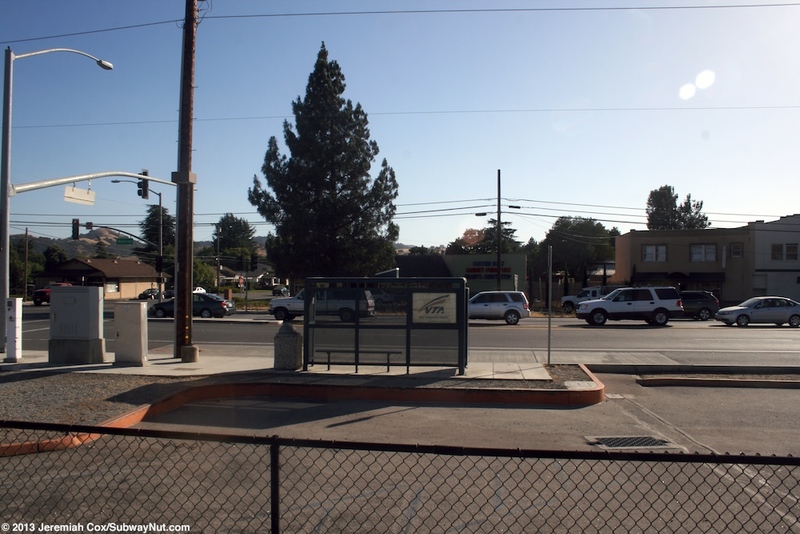 This free parking lot can accommodate just one row of parked cars (with angled parking) and extends from San Martin Avenue north to more than double the length of the platform all the way to its end across from a T-intersection with Roosevelt Avenue. 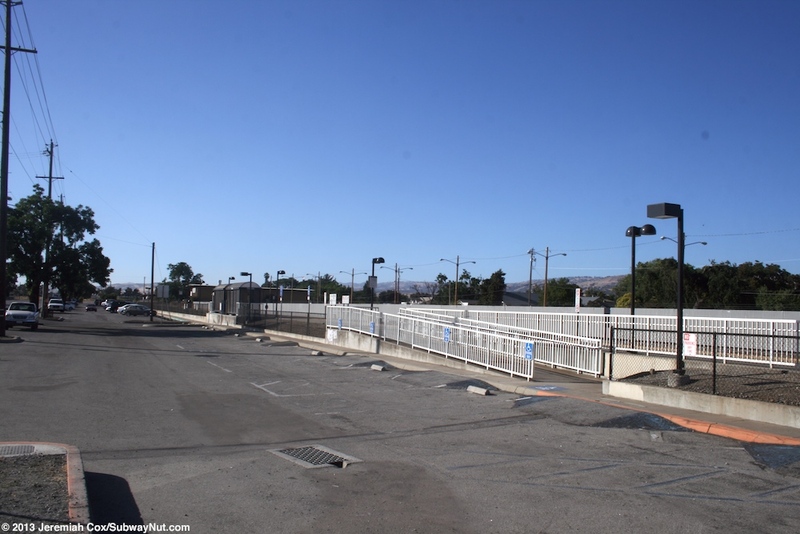 The parking lot is larger than necessary and could use some restriping, the northern end of the lot looks like it is almost abandoned. 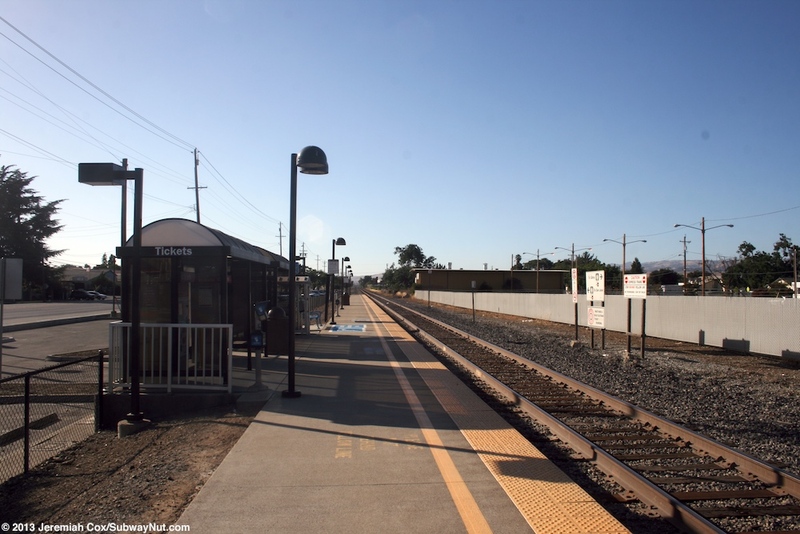 It was clearly built by the VTA (a few express buses also provide riders) and their rules of conduct are posted. 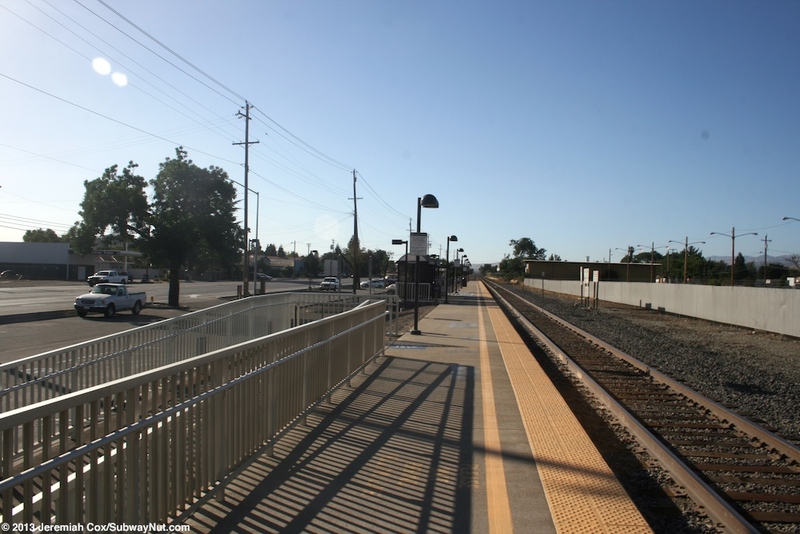 The low-level platform is about six steps above the parking lot. It has a tactile warning strip. 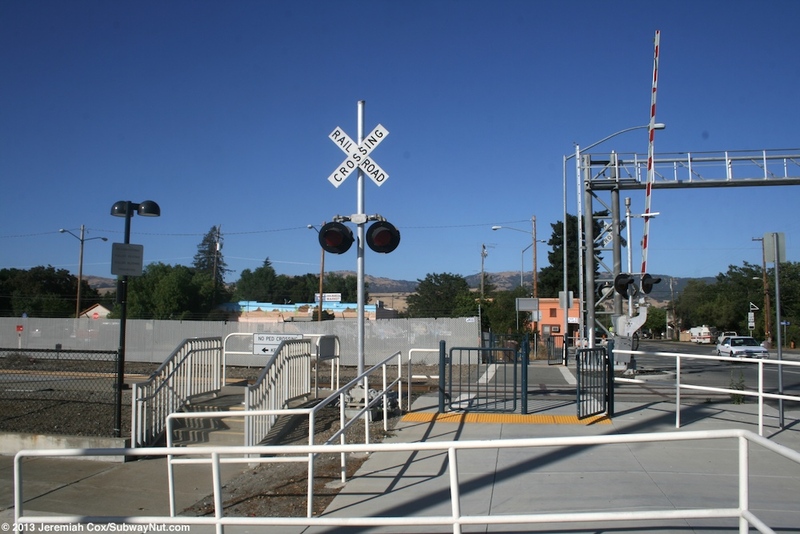 There is a fence between it and the grade crossing before it begins with a staircase; this is followed by a short ramp. The parking spaces near the ramp are some ADA parking spaces and also some 15 minute pick-up/drop-off spaces with green concrete blocks at the base of them to indicate these. 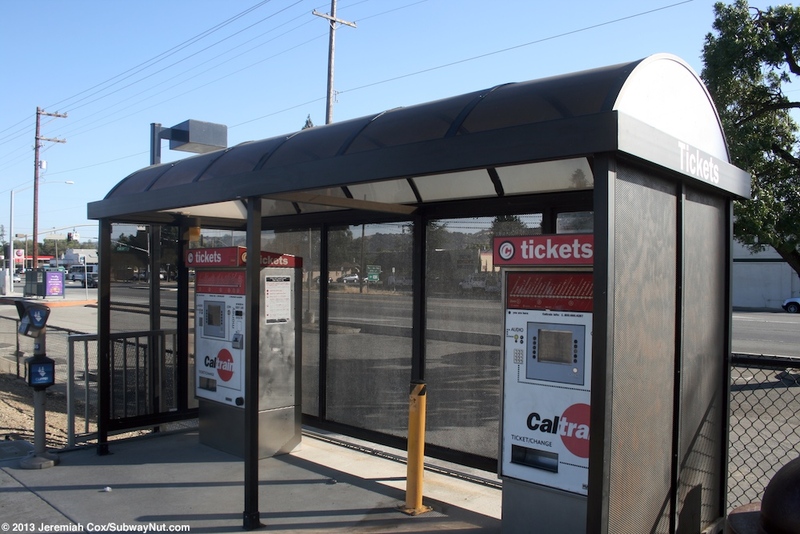 Next, about a car length down, are two black bus stop shelters with curved roofs. 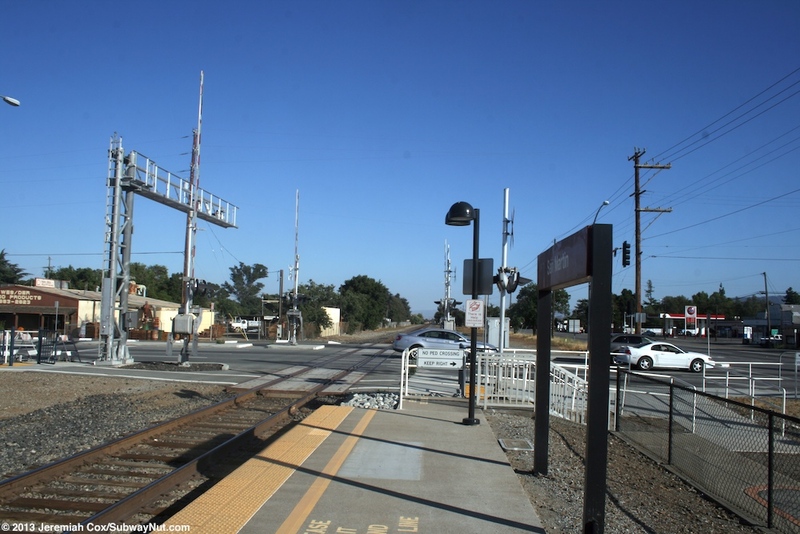 The first one covers the station's two TVMs, the next has a built in bench. Next to this is a mobile-lift in a small white, fenced off enclosure for ADA access. 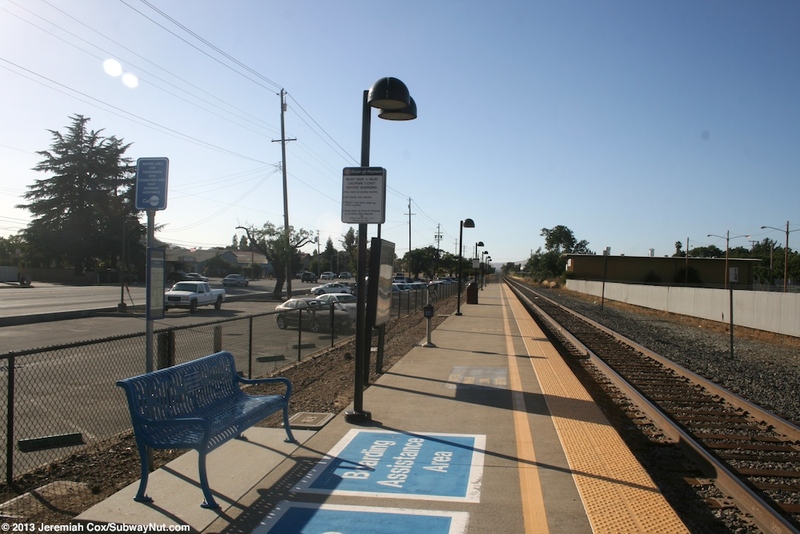 Next to this is the only other bench on the platform. 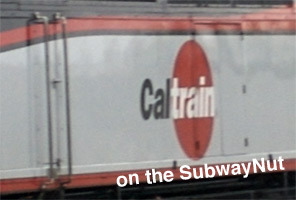 A blue one designed to be sat in by Caltrain passengers requiring assistance (it lines up with the ADA car where a crew member is always posted). There is then a train information display. 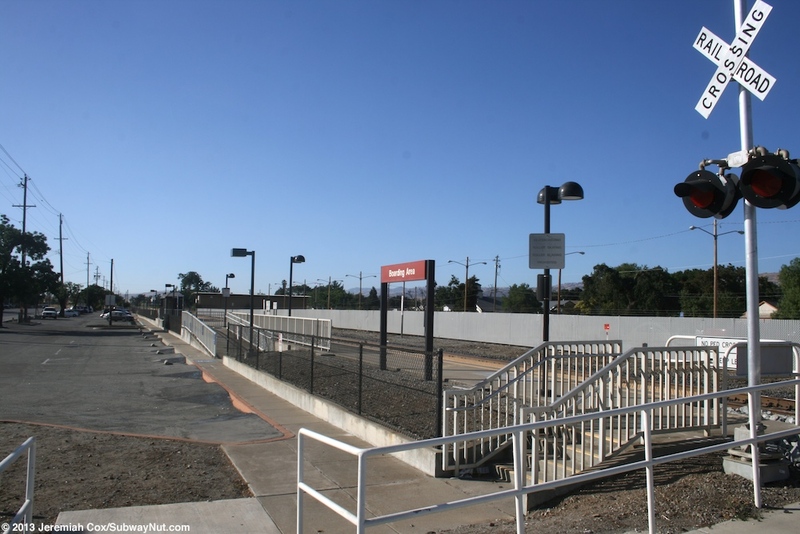 A second entrance staircase is towards the northern end of the platform. 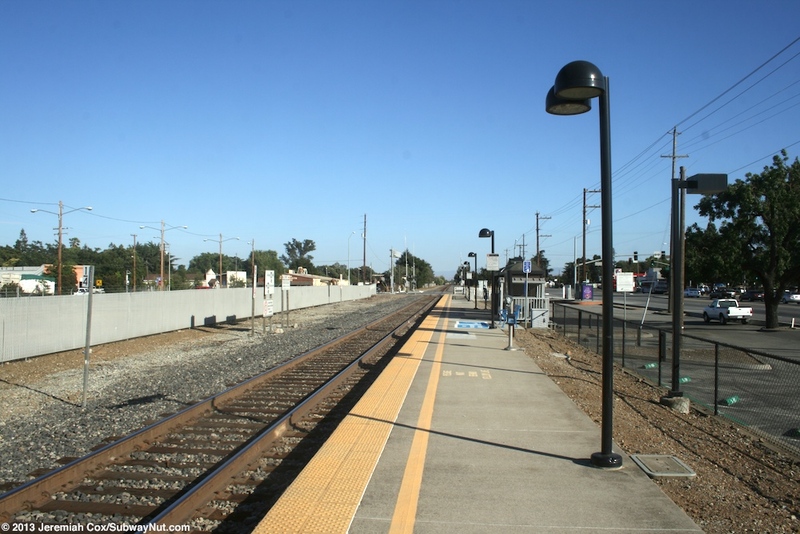 The only other platform amenities are black round lampposts and some concrete trash cans. 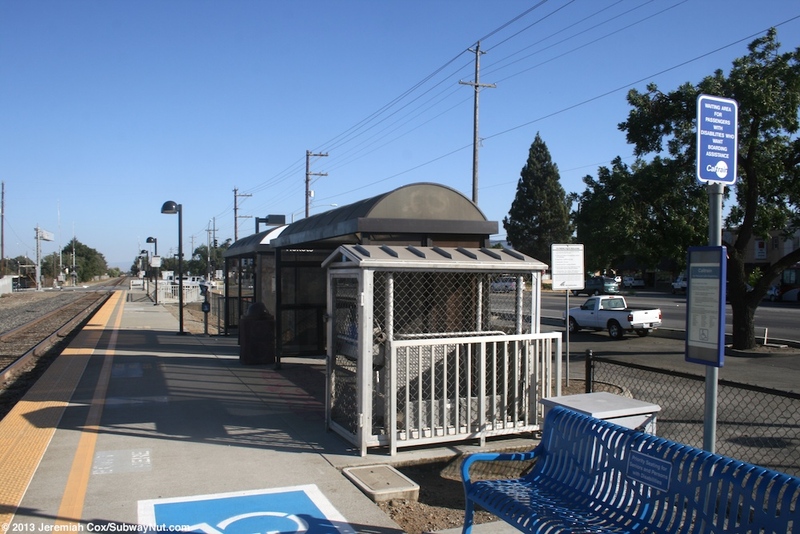 The large bus shelter for Route 68 that runs between Gilroy and San Jose at the corner of San Martin and Monterrey with a bench provides more shelter than the two smaller shelters on the train platform. 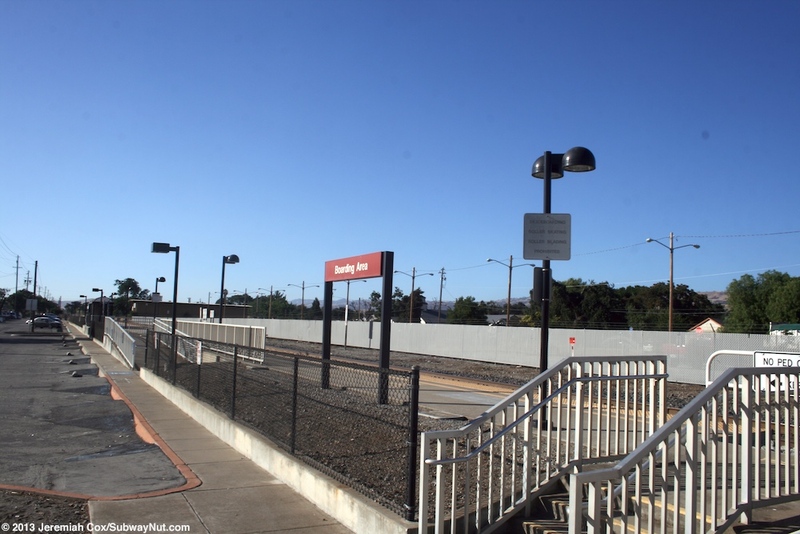 Signage for trains is minimal, just two red signs, one towards each end of the platform. 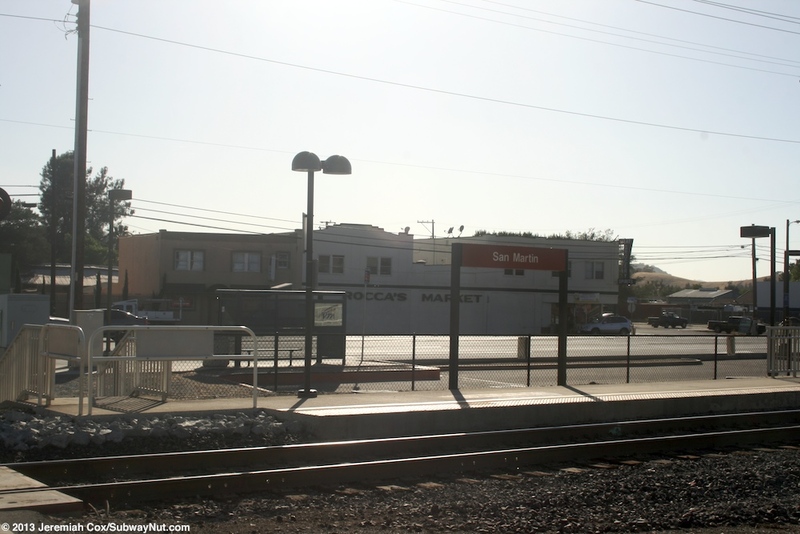 These say Boarding Area facing the parking lot and San Martin facing trains. 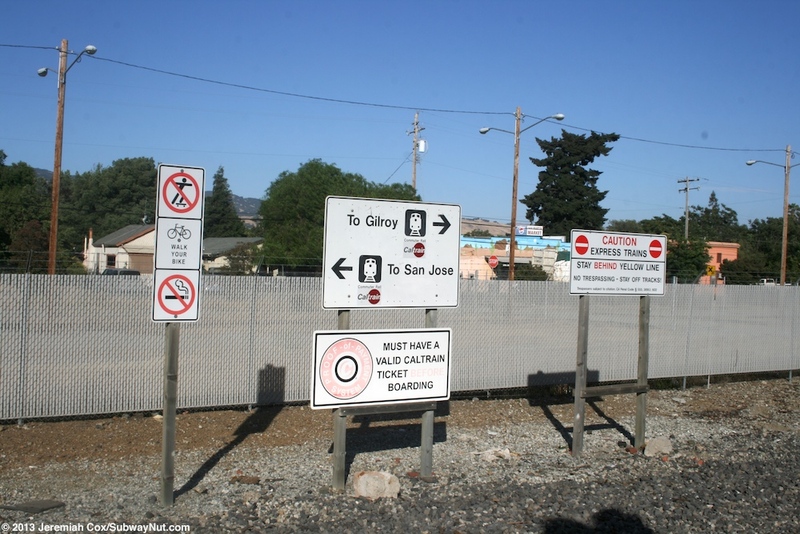 There is also the normal direction of travel sign (with arrows To Gilroy and To San Jose) across from the platform and the normal Walk Your Bike, Proof-of-Payment signs. 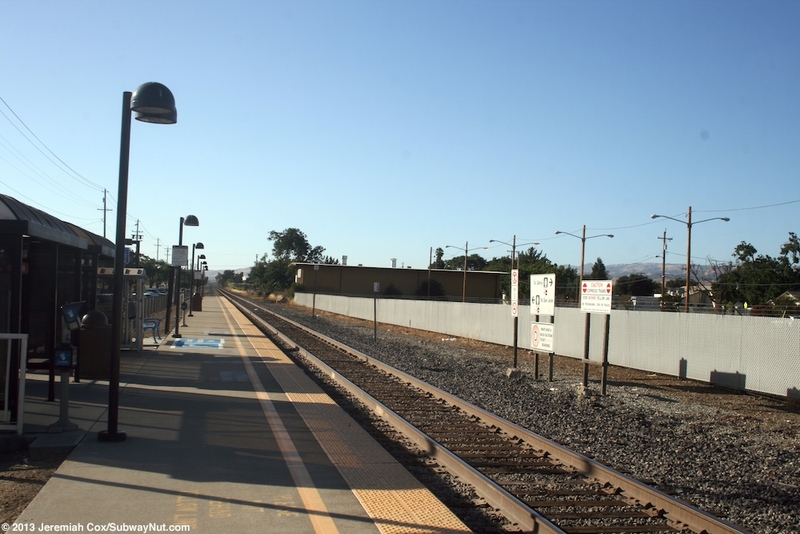 There is also a generic Caution Express Trains, Stay Behind Yellow Line sign (the only other trains here is the Coast Starlight and freight trains).